The Vancouver Condo Buzz » ONE-DAY SELL-OUT Grand Opening at Station Square Burnaby Metrotown Condo Presales! First Presale Metrotown Station Square Tower Condominiums Start From $280’s! ONE-DAY SELL-OUT Grand Opening at Station Square Burnaby Metrotown Condo Presales! First Presale Metrotown Station Square Tower Condominiums Start From $280’s! ALERT: GET ON THE VIP LIST FOR RESCISSIONS + GET AT THE HEAD OF THE LINE FOR THE BURNABY METROTOWN STATION SQUARE PHASE 2 TOWER RELEASE! Excitement Builds for Presale Burnaby Station Square Grand Opening Launch! The Grand Opening Celebration Event for Metrotown Burnaby real estate’s most exciting new development is on Saturday, October 20th! During the celebration event, prospective home buyers can enjoy refreshments and tour the brand new 8,000 square foot brand new presale Burnaby Station Square presentation centre. There, home buyers can also tour around the 2 designer display homes and experience what all the excitement is all about right here at the Metrotown Station Square Burnaby presale condo project. In addition SALES START SATURDAY, OCTOBER 20th, so make sure you visit this weekend for the best selection of pricing, suites and floor plans. As you may know already, the presale Burnaby condos at Station Square are located in the heart of Metrotown community, which gives you unbelievable access to shops, markets and cafes, public transit routes (including the SkyTrain) and entertainment venues. Also nearby are beautiful parks and top rated schools. 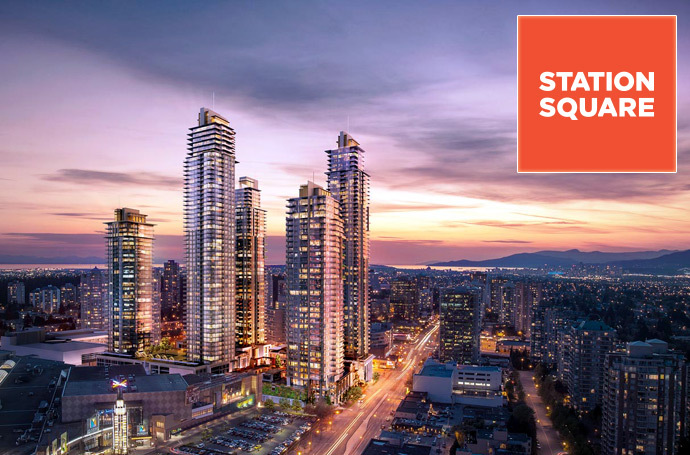 And with prices starting in the low $280,000’s, Station Square Burnaby presale condos are truly affordable for homes that offer urban living in a prime Metrotown Burnaby real estate location with amazing views in every direction. In addition, the new Burnaby Station Square floor plans are available online for you to review. You can see the full selection of Station Square floor plans at the presentation centre this weekend as well. The master planned Station Square Burnaby condo project involves the redevelopment of a 12 acre site at Silver Drive and will feature a new and vibrant pedestrian centric hot spot that will include restaurants, outdoor cafes, shops, and a unique outdoor city room style for gatherings and to soak in the urban vibe of this new Metrotown Burnaby community. Learn more about this exciting new community at the grand opening Station Square condo celebration. The project is brought to you by Beedie Living and Anthem Properties. The glass and concrete architecture is by award winning and world famous Chris Dikeakos Architects Inc (CDA) and the first release of the new Station Square Burnaby condo tower is 35 storeys in height with retail on the ground floor. The homes and building will be built to LEED Silver equivalent standards and the two storey main lobby with be fully furnished and will have a concierge desk. There is a well lit and secure underground parking garage in addition to building fob access and restrictions for each residential floor. More information about the masterplanned Station Square Burnaby real estate development is located here. At the grand opening celebration of Metrotown’s Station Square condo project by Anthem Properties and Beedie Living, potential home buyers will have a chance a viewing 2 display homes that are fully furnished. Here, the sales associates will mention that if you purchase early, you will have a chance to select between 2 designer colour palettes that include Classic (obviously more traditional) and Contemporary (again, obviously the more modern look and feel). The living areas of the new presale Burnaby Metrotown Station Square condos will include nine foot ceiling heights in most homes as well as engineered laminate wood floors with plush carpeting in the bedrooms. All of the windows will have horizontal blinds that will provide residents with ultimate privacy. In addition, all homes at the Station Square condos in Metrotown will come with stacked washer and dryer in insuite laundry closets/rooms. The homes are heated with efficient electric baseboard heating system and of course, they all come with the National 2-5-10 New Home Warranty program. The bathrooms at the presale Burnaby condos includes soaker tubs and Duravit toilets, Grohe fixtures in chrome finish, polished hardware in chrome finish and under mount sinks for the truly modern look. In addition, the Metrotown Station Square Burnaby condos will have porcelain tiled surrounds, porcelain tiling on the floors, select bathrooms with glass shower surrounds, quartz counters (better than granite or marble!!!) and soft closing cabinet hardware throughout and for the flat panel modern cabinets. The kitchens are absolutely stunning and will include a premium stainless steel appliance set by Porter & Charles in addition to an integrated Liebherr fridge/freezer (bottom mount). Other features at the Metrotown Station Square condos in Burnaby real estate market include garburators in the main sink, Grohe faucets in chrome finishing, under mounted stainless steel sinks, luxurious quartz counter tops and backsplashes which are healthier than granite and more durable and scratch resistant compared to marble. The Station Square Metrotown condos will also feature high gloss white cabinets in the centre islands which are ideal for entertaining, having a drink, preparation or cooking. The cabinet hardware is also soft closing and the flat panel lower cabinets are coupled with opaque glass upper cabinetry for that truly modern and clean look. The hardware (pulls for drawers/cabinets) are all brushed aluminum and there is recessed puck lights. The ground floor retail space under each of the high-rise towers at Station Square Burnaby will also be home to new retail and commercial space. On the ground level, there will be several new restaurants and cafes for you to enjoy year round, and just steps from your front door. These are new renderings of the living room, kitchen, panoramic views and ground floor retail that are published on Station Square’s web site and posted here to promote their development and Grand Opening Celebration.